Last week I was at a concert of The Arling’s Bombay Connection Band in Paradiso, Amsterdam. The Bombay Connection is a project of Edo Bouwman and Milan Hulsing, and if you want to read a bit more, try this. The succes of the two CD’s/LP’s, which are only the first volumes in a series of at least eight, inspired Gerry Arling to start a band that can play this music live. He did an incredible job: with only a drummer, a bass player (Mr Arling himself), a wahwah violinist, a keyboard player, a guy who played flute, sax and theremin, a tablas player and a sitar player, the band created a complete Bollywood experience. Their repertoire is a mix of original Bollywood tracks and compositions of Gerry Arling; mainly up tempo Bollywood 70’s style dance funk. The band played the songs as a virtual score to a movie ( Gunmaster )that was projected behind them. I am not a fan of Bollywood movies, I would have preferred to enjoy the band without the movie, but the audience seemed to enjoy themselves and I had a great night too. Probably this was the first time ever that a band played this kind of music live on stage! 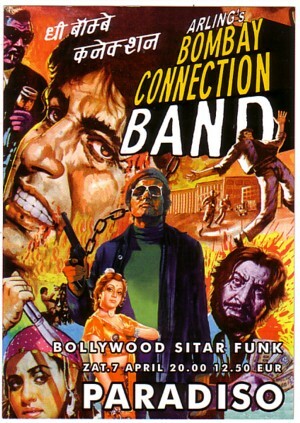 Arling’s Bombay Connection Band has plans to record a CD before the year is over, so this story will be continued. After the concert a DJ ( Jo-Hans ) played some modern Bollywood songs that I didn’t know, but that completely blew me away. Man, what a spectacular dance music!!! I will try to find out what that music was and come back to this later. I wish I could share one specific track with you here and now, but I don’t have it. I don’t even know the title or the artists! But here is a track that will certainly please a few readers of this Soundtrack. It is a song from a CD with Pakistan floorfillers, that Milan Hulsing plans to release. The working title for this project is UMP!, and I have no information on the songs that are on the demo that I got from Milan. But I think we can call this song Geena. Great music, I was actually there to live it live..I need a CD for thr Bombaay Connection.